Groom saves a little boy from drowning . . .
. . . It was like fate almost, we were meant to be there. 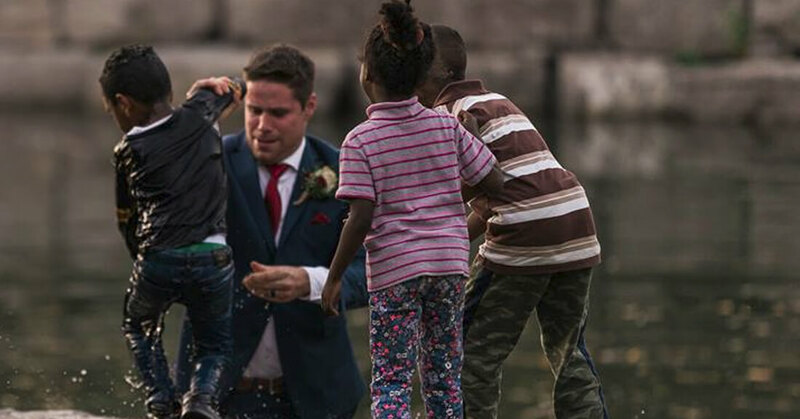 A groom has been praised for saving a drowning boy while having his wedding photoshoot. The newlywed Canadian couple were taking photographs in a park following their ceremony when they noticed the young boy struggling to swim in a nearby pond. Clayton Cook swiftly ran to the boy's aid, jumping into the pond to pull him out of the water. Their savvy wedding photographer Darren Hatt captured the event and posted the images to Facebook, which have now been shared nearly 3000 times. Cook and his new wife Brittany had just left their wedding ceremony in Kitchener, Ontario when the dramatic scene unfolded. Photographer Darren uploaded two images of the groom helping the young boy out of the pond, wearing his tuxedo whilst knee-deep in the water. The child's face was reportedly fully underwater and he was struggling to pull himself up until Clayton pulled him out. "A special shout out to last night's groom Clayton!" he wrote in the widely-shared post. 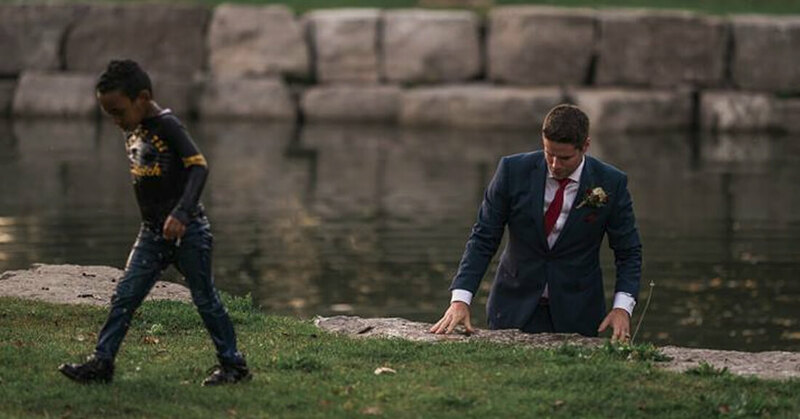 "While I was taking solo pictures of the bride this little guy was pushed into the river behind me by another child. "By the time the bride noticed and shouted out, Clayton had already jumped down and brought him to safety. His quick action saved the little guy who was struggling to swim. Well done sir." The budding photographer tagged Ellen DeGeneres in the post, presumably hoping to get the attention of the popular US talkshow host, who regularly champions adorable stories like these, which exhibit the extent of human kindness. "Well done the world needs more people like you," wrote one person. "What an awesome guy. He's a keeper!" added another. Others were quick to question the whereabouts of the child's parents, who had left their son swimming unattended. As for wife Brittany, she says the heroic act is characteristic of her husband: "That's Clay, like that's Clay to me. It's something he would just instinctively do," the bride told CTV news. "It was like fate almost, we were meant to be there."